How do I reorder files in a folder or reorder folders on a site’s Resources? 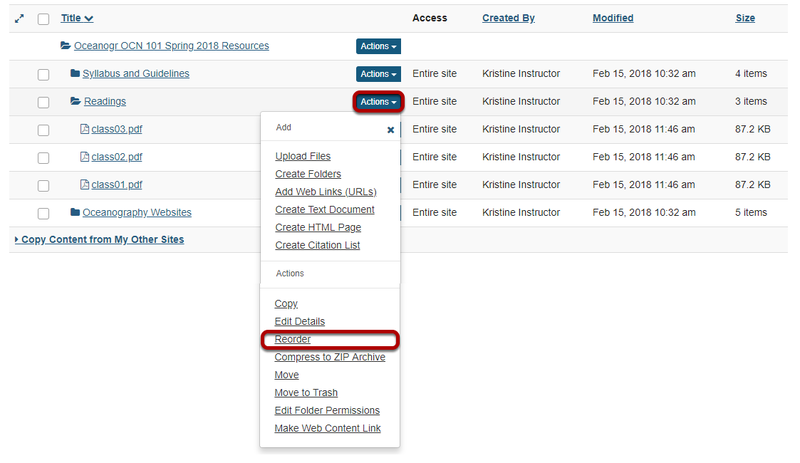 Sakai Community DocumentationSakai 19 User Guide (English) ResourcesHow do I reorder files or folders within Resources? Anyone with access to view Resources sees the reordered items in the desired order. If an instructor wants students to go directly to Resources to locate content items, this feature allows the items to be placed in a specific order. Or, if you have used the Make a Web Content Link option to place a Resources folder into the Tool Menu, the reorder feature controls the placement of items on that page as viewed by site participants. The process is the same for reordering both files and folders. However, items must be within the same parent folder in order to be reordered at one time. Zoom: Files: Click Actions, then Reorder. In the parent folder, from the Actions drop-down menu, select Reorder. This displays the Reordering page. Zoom: Reorder items and Save. Click and drag the items into the desired order, then click Save. Prev: How do I copy a Resources file or folder from one site to another site? Next: How do I upload a new version of a file in Resources?